This past Saturday I had the pleasure of sharing the kitchen with my good friend and fellow photographer, Nathan Padilla Bowen of Padilla Bowen Photography as he showed me a few of his favorite dishes from Trinidad. It was amazing to me how three curry dishes all with similar ingredients could taste so radically different and scrumptious. What a treat it was! 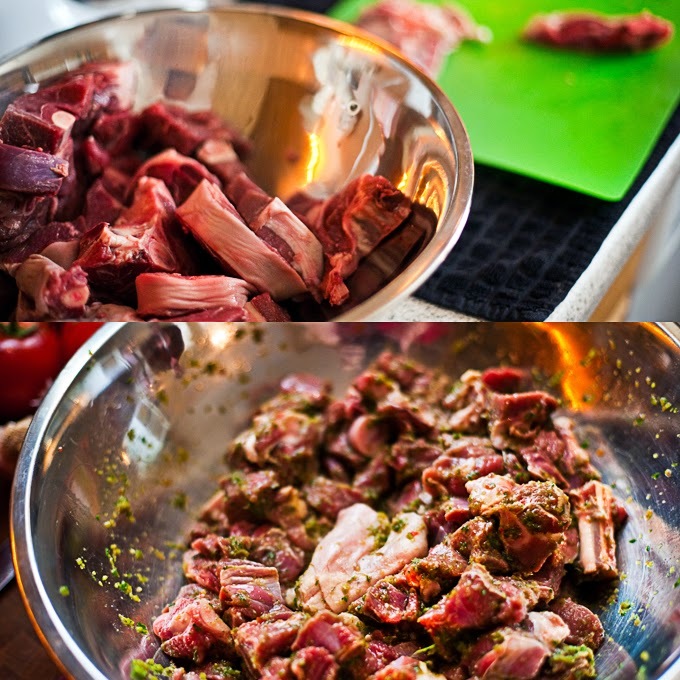 The basis for most authentic Trini food is "green seasoning" that I liken to sofrito or even a kind of chimichurri. Trini households make this condiment fresh daily. Nathan's ultimate recipe for it differs slightly from the recipe at the end of this post but it's quite similar: onions, red bell peppers, cilantro, garlic and a few additional fresh herbs. It's really quite fragrant and visually lovely. I've known Nathan's wife Jessica since before they were married when Jess was working at the La Jolla Playhouse in the marketing department as the assistant marketing director. For several years, I only knew her as a name in my inbox and a voice I heard once in a while on the phone. At the time I was a Features Photo Editor working primarily with the local arts community so our conversations consisted mostly of dress rehearsal times and photo ops. After tackling the green seasoning, next up was getting started on the yeast-based dough for the Bara. 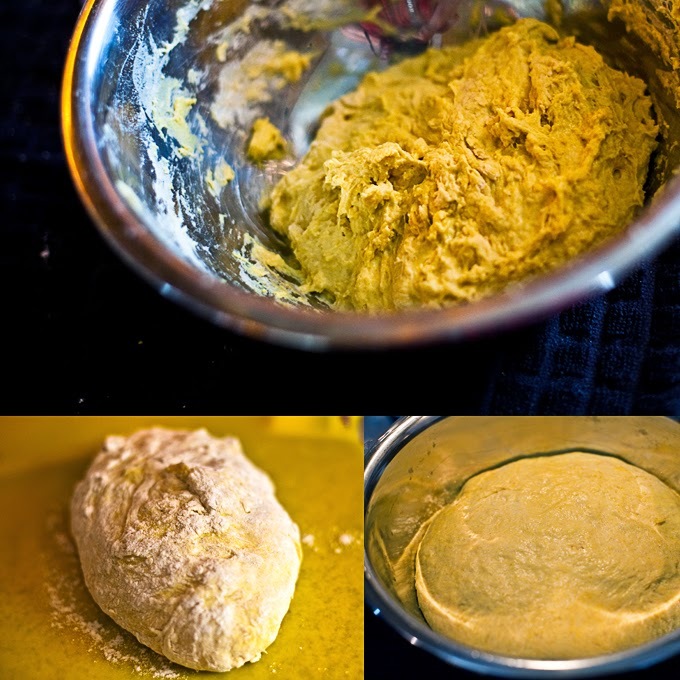 This dough was an absolutely gorgeous yellow made so by the addition of turmeric. After allowing it to rise a few hours, I divided up the yeasty goodness into golf ball sized pieces and then hand formed them into small disks. Nathan pan fried them as fast as I could make them. A while later, she told me she was getting married and having been told by a photographer I helped to supervise that I made my own jewelry, she asked to see some of my work prompting our first face to face meeting. She ordered something for the maid of honor and chandelier earrings of pearls and Swarovski for her wedding day and in doing so, became by first ever paid jewelry customer. We became fast friends that day. Goat shanks needed cleaning. This was my task. I removed excess fat and any skin, then cubed it. Followed by the addition of half of the green seasoning. It was then placed back into the fridge to marinate. Jump forward several years and our friendship has grown to include her lovely husband. Recently, Nathan quit his job (custom cabinetry) to follow his bliss and run his own business – photography. 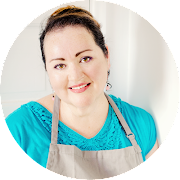 Besides being delighted watching him grow his photography business and develop his style, we now share three awesome interests: photography, cooking and the thing that started it all, a profound respect and admiration for his beautiful wife. While I worked on the goat and then cleaning the chicken, Nathan got started on the Curried Channa. The aroma that rose up and out of that pot were intoxicating! After combining all the ingredients, the pot was placed in the oven to braise all afternoon. Nathan loves to cook and I've had the pleasure to share many weekend afternoon brunches and early evening dinners at their Encinitas home. Usually, Nathan is in the kitchen cooking while Jess is in charge of keeping the glasses filled and guests entertained. Next up was the goat since it's a tougher cut of meat, it would need a good amount of low-temp braising. There is nothing more amusing than two cooks in the kitchen. 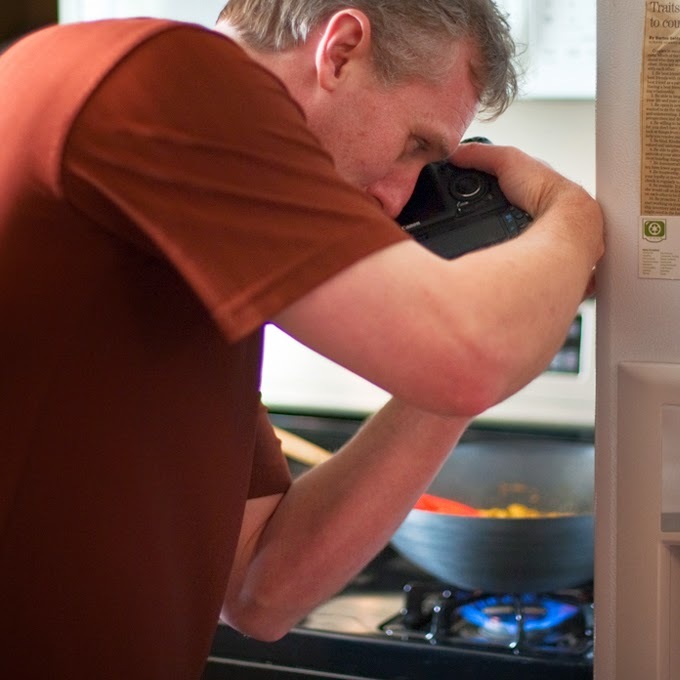 Unless of course those two cooks also happen to be photographers vying for their own "time with the food." Here's Nathan grabbing a photo of the curry with his own camera after he fumbled a bit with mine. Funny how, even though we have the same brand camera though slightly different models, we felt most comfortable with our own camera in our hands. Deny it if you like, but photographers definitely get used to their own equipment, customizing settings to their individual shooting styles. One of those evening dinner parties a few years ago introduced me to Trini food. Nathan's love of Trini food began after he and Jess spent some time in Trinidad with some friends. He introduced me to "buss up shut," the colloquial term for Paratha-Roti, a flatbread similar to Mexican flour tortillas in taste called "buss up shut" because after it's pulled from the hot griddle, it's busted up and looks like a torn shirt after doing so. I also learned about curried goat, curried chicken and curried channa (channa is chickpea or garbanzo bean depending on where you are from). And now, thanks to a really fun day playing sous chef in Nathan's kitchen, I'm excited to try some of these ethnic dishes at home on my own. I'm also thankful for getting to know Nathan better. As we prepared the evening's meal, we spoke about recipes, our favorite knives, and, a-hem!, scary condiments. One of which he was dying to show me. While he was out ingredient shopping for the meal, he had come upon fish sauce that he HAD to buy he said. He excitedly pulled it from the cupboard and in doing so, marred me for life as a thousand little bitty eyes stared back at me! If you read this blog much, you now my distaste for fish. And this tiny bottle had actual teeny tiny fishies floating around in it. Not fearing that this will date me, let me just say, it like, totally grossed me out! If you notice on the very first photo of this post, the Double is topped with a bright orange sauce. This is a papaya-based hot sauce that Nathan whipped up basically from memory. In Trinidad, it's four-alarm hot. But with my wimpy, I repeat, WIMPY, tastebuds, he refrained from what he assumed were several habeneros to a mere two of these heat bombs. I loved the sweetness and slight heat. Slight heat that is until I was several bites in and the inside of my mouth started to tingle. Yes, I'll say it again, W I M P Y! Nathan: Well, it's difficult to determine 'earliest' from such young memories, but I remember one very clearly: It was making 'Gingered Meatballs' from the authentic 'Peanuts Cookbook' when I was maybe five or six years old. It was a huge adventure where my mom took me to buy the ingredients and I measured and mixed and made the meatballs myself. They were fantastic! The cookbook was a little green hardback thing with maybe two dozen kid friendly recipes. I distinctly remember the comics inside. one specifically where Linus offers to get Lucy some toast, and brings her a slice of bread. She screams "Raw toast? You brought me RAW TOAST!?" I thought that was hilarious. 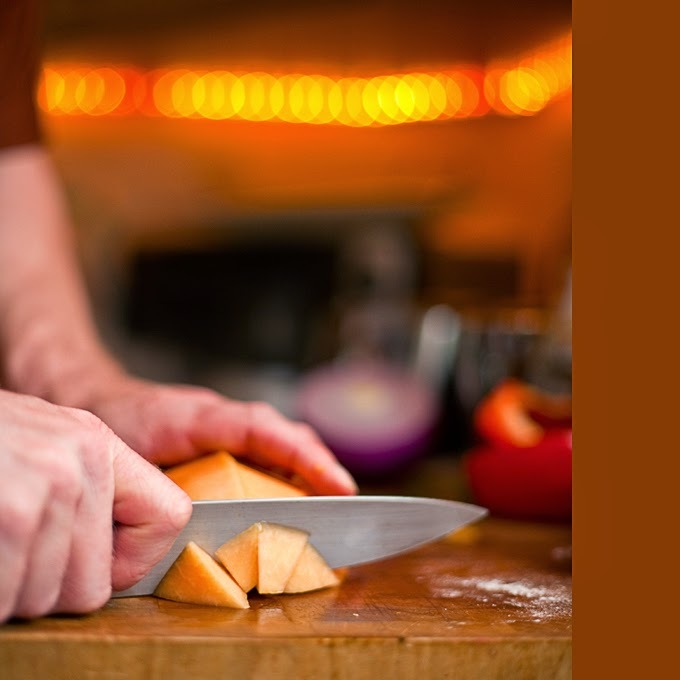 When did you first realize that you enjoyed cooking and what is it about it that appeals to you? Whew, again so early in life. I distinctly remember wanting to grow up and be a chef at a very early age. Somewhere along the way I learned the difference between cooking for fun and cooking for money. I cook for fun. I also have no respect for recipes or consistency. I use recipes all the time, but I often find myself diverted from the exact preparation either by circumstance or adventure. Do you have a favorite dish or speciality you love to make? The easy answer? Whatever I'm inventing from scratch at the moment. If it doesn't turn out well, then it's not my favorite anymore! Okay, so that's a cop-out answer. You hear this from a lot of people who cook, that it always comes down to the simple things, eggs, pasta, potatoes, chicken, steak...simple foods cooked with love that everybody can love together. An easy favorite for me is small ciabatta rolls sliced in half the flat way, doused with plenty of olive oil and a smidgen of garlic, salt and pepper, then grilled on the cut side only . We lovingly call it 'toasty bread' here at home and it's always a huge hit. We're cooking some dishes from Trinidad today. Trini food isn't something you hear much about here in San Diego. What turned you onto it? A trip to Trinidad & Tobago in 2005. 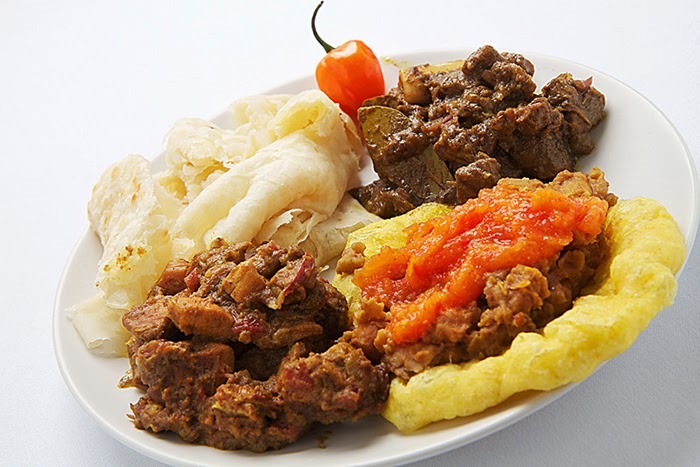 Eating real Trini food in friends' homes and small village establishments is a very unique experience. The chalkboard menu on the wall was only a suggestion of what they might actually be serving today. Funny story: It's the only place in the world where, when we asked nicely for an extra plate to share our various dishes (a table full of them), the girl thought about it for a moment, looked wistful, smiled slightly and said "NO". What!? Did she just say NO? Not even an attempt at explanation or an apology. Just NO. Ha Ha! Only in Trinidad. They also have a fantastic bottled soda called LLB. Last time I checked you can't get it here in the states. It's actually based upon an Australian concoction as far as I know. If you look up a recipe you can fake it at home well enough. Highly recommended. Is there a dish or particular cuisine that you haven't tried yet that you'd love to try? As you already know, I'm rather fearless when it comes to food and cooking. Anthony Bourdain is practically my hero. So, well, I've never cooked a whole animal head, preferably in a real pit fire. That would be pretty fun. Of course it would be even better if it's something big and scary, too, like a buffalo head. I can think of a pretty short list of people who would actually come to that barbecue though. Last to be cooked was the roti. Nathan used a cup dipped in ghee (clarified butter used often in Indian cuisine) to "abuse" the roti as it bakes on the griddle. This helps the bread "break up" after it's pulled from the griddle creating what is known as "buss up shut" as it resembles a torn up t-shirt if abused properly. 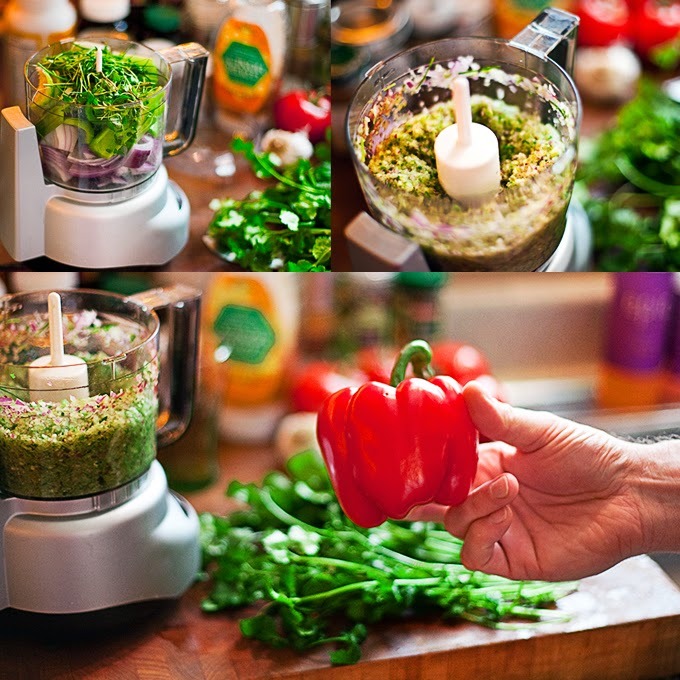 Put all ingredients into a food processor. Pulse until very fine or pureed. Refrigerate and use within a week. To help it keep longer, sub 1 tablespoon of the water with 1 tablespoon white vinegar. For bara: In a large bowl, combine flour, salt, turmeric, cumin, sugar and yeast. Add enough lukewarm water to make a soft dough. Mix well. Cover and let rise for 1½ hours. For channa: Heat oil in heavy bottomed pot. 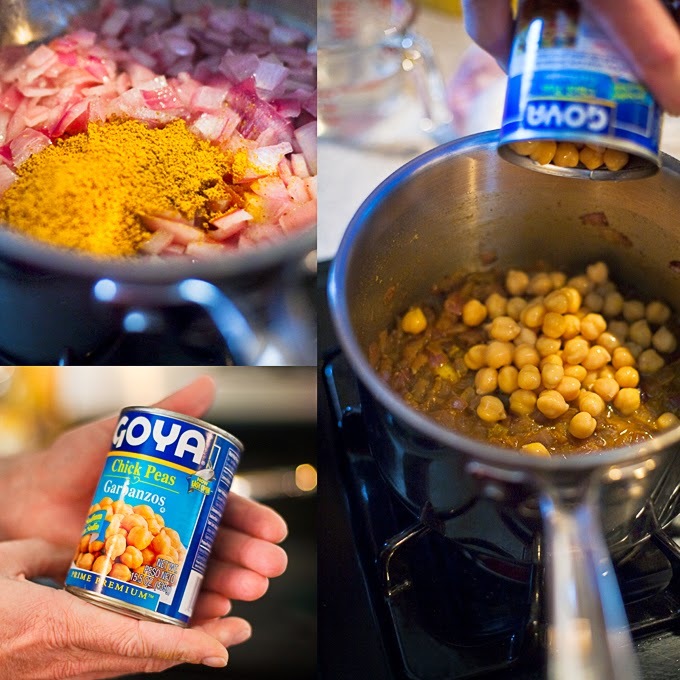 Mix the curry powder with ¼ cup water to make a paste. Add onions, garlic and the curry paste to the hot oil. Saute for a few minutes. Add the channa, stir to coat well. Cook for 5 minutes. Add 1 cup of water, pinch of cumin, salt and hot pepper to taste. Cover, lower heat and simmer until peas are soft. Add more water if needed. Adjust seasoning. Once the peas are soft and moist, use a potato masher or fork to mash the peas. This will make it easier to spread on the bread. Punch down dough. Allow to rest 10 - 15 minutes. Pinch about a tablespoon of the dough, form a ball then using floured hands, shape into a flat disk about 4" in diameter. Fry a few at a time in hot oil. Turn once and drain on paper towels. You can spread the channa on the bara and fold to make a taco or place channa on one bara, top with another to make a sandwich, or "double" as this is known in Trinidad. A hot pepper sauce or mango chutney goes very well with this dish. Trim and wash the goat. Cut into bite-sized pieces. Place in a large bowl. Season with salt and black pepper. Toss in garlic and green seasoning. Heat oil in a heavy pot. 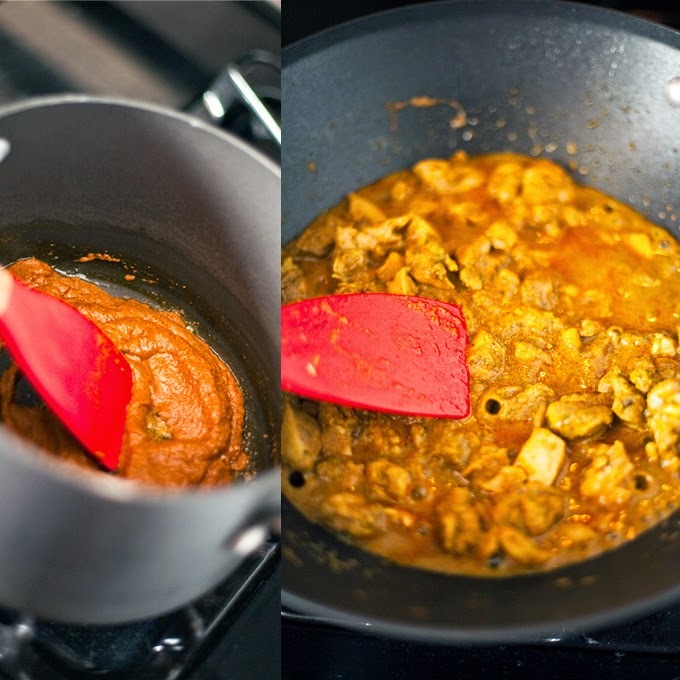 Mix curry powder with 1/4 cup water to form a paste. Add bay leaf and the curry paste to hot oil and sauté for one minute. Add meat and garlic. Sauté for 10 minutes, stirring to coat. Add water to meat. Bring to a boil. Cover and simmer on low heat until meat is tender. About 2 hours. Adjust salt and pepper before serving. Serve on a bed of rice with roti. Cut chicken into bite-sized pieces. Season with garlic, green seasoning, salt and hot pepper. Marinate for 30 minutes. Heat oil in a heavy bottomed pot or large skillet. Mix curry powder with 1/4 cup water and make into a smooth paste. Add to hot oil and cook for 2-3 minutes. Add chicken, stir to coat. Cook for about 10 minutes. Add tomatoes and onions. Cook for 1 minute. Stir in 1/2 cup hot water. Lower heat to medium. Cover and cook until meat is tender. Add more water if needed. Adjust seasoning and hot pepper to taste. Sift first three ingredients. Add enough water to form a smooth soft dough. Knead well and leave for 1/2 hour covered with a damp cloth. Knead for second time and divide into four balls (loyah). 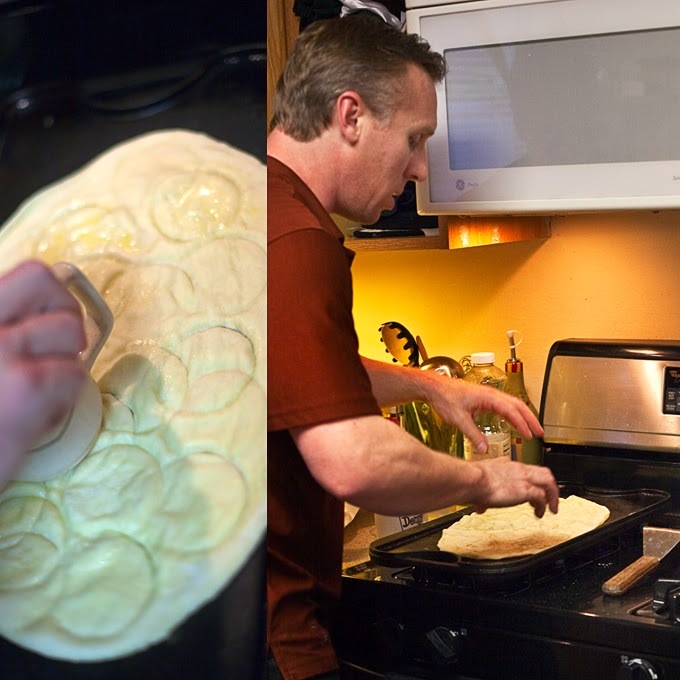 Flour board and roll out dough to the size of a dinner plate, about 8-9 inches. Spread with ghee and sprinkle with flour. Starting at center, cut dough to edge. Pick up one edge and carefully begin rolling tightly all the way around to form a cone. Repeat with other three portions. One at a time, press peak of cone straight down to flatten until all four cones have been flattened. Let rest for 30 minutes. Sprinkle flour on board and roll the bread out to very thin with a rolling pin. Spread some ghee out onto a hot griddle or baking stone. 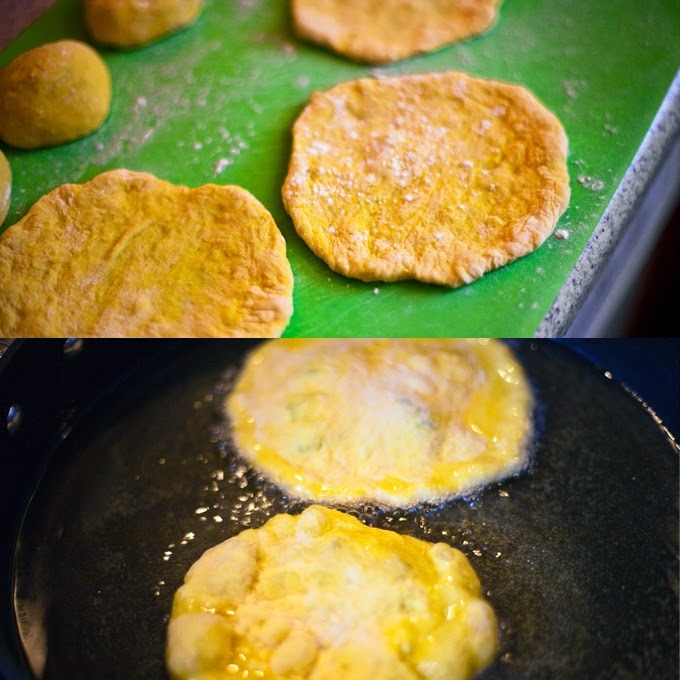 Bake bread, coating dough with ghee on both sides as it cooks (about 1½ minutes on each side). Remove from baking stone and hit with wooden pallette until flaky or wrap in clean cloth and mash up to create the appearance of a torn up shirt ("Buss-up-Shut"). Lesley! Yay! So glad you had a chance to take a look at the post. And thank you for the kind words! I would love to go one day too! See you in a couple of weeks.